9. The Duchess of Cornwall wore her favorite diamond and pearl earrings to Cheltenham on Wednesday. 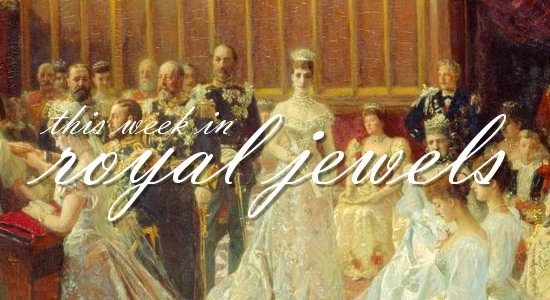 On Monday, she wore the same pair at Westminster Abbey with a diamond and pearl choker. 8. The Queen repeated her round gold brooch with a purple ensemble for a reception on Commonwealth Day. 7. At the Vatican, Queen Mathilde of the Belgians exercised the privilege du blanc -- the right of a Catholic queen to wear white when meeting with the Pope -- on Monday. She kept her jewelry simple, wearing a watch and a bracelet on her left arm. 6. Crown Princess Victoria of Sweden chose dangling earrings to celebrate her name day on Thursday. As always, however, adorable Princess Estelle was the real star of the show. 5. Queen Rania of Jordan and Princess Lalla Salma both wore distinctive earrings during the beginning of a state visit in Morocco on Wednesday. 4. On Tuesday, Queen Elizabeth II christened a new ocean liner, the Britannia, while wearing her Pearl Trefoil Brooch. 3. Queen Letizia of Spain chose dramatic gold earrings for a visit to the National Library on Wednesday. 2. Queen Maxima of the Netherlands wore an interesting set of black beaded jewelry -- necklace earrings, and ring -- to visit a school on Monday. 1. The Queen brought one of her lesser-seen brooches, a floral piece given to her during a 1981 visit to Sri Lanka, on Wednesday; it was an extremely appropriate choice for a private audience with Sri Lanka's president.